Pieces of broken tile offer creative opportunities in decorating. You can use them just for aesthetics, for function or for form and function. Although ceramic or stone tiles are good to use, you are not limited to using them. Pieces of broken vinyl tiles, called vinyl composition tile (VCT), have their uses as well. Just be sure to match the tile to the project. You can use ceramic and stone tile pieces for both indoor and outdoor projects and VCT primarily for indoor projects. Get really creative with broken tile pieces. Use broken tile pieces to decorate many vertical and horizontal surfaces inside. Use them to cover an entire vanity top, or use them for spot treatments such as a medallion on the face of a fireplace mantel. You might create a mosaic in a selected area of a floor where you are replacing tiles or adding them. Tile pieces also serve as backsplashes for kitchen and bathroom counters. Consider using tile pieces to replace tub and shower tiles that are broken and too old to match. Lay out an interesting pattern on the top of an old desk. You might also apply them on the face of a coffee table edge. Dress up an old mirror or a picture frame with tile pieces. Create intricate patterns and designs on the tops of outdoor tables. Add a mosaic made with tile pieces and concrete to a flagstone patio. Dress up the front of the mailbox. Embed tile pieces in the surface of newly poured cement. Cover a birdbath in tile pieces and liven up the sundial by adding tile pieces around the base of the dial. Add a design to your chiminea or to the edges of your outdoor fireplace or fire pit Use tile pieces to tie together an outside building wall and a patio or deck by bringing a narrow line down the vertical wall and across the horizontal floor. Cover the top rail of railings and stairs with tile. Create an interesting tile pattern on the outside portion of window sills, or create an arch over the window tops. 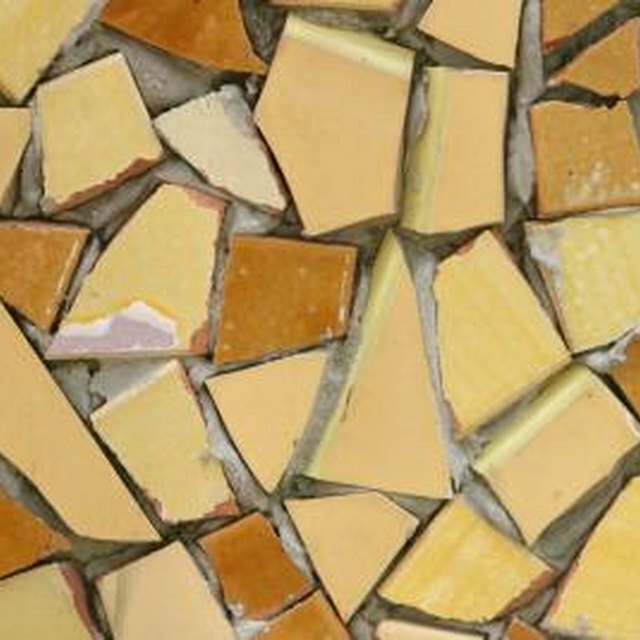 If you do not feel creative and you just want to get rid of your old tile pieces without adding them to a landfill, consider using them as fillers. The next time you mix up a bag of cement, add some ceramic or stone tile pieces to it. Use small pieces to fill in low areas before adding gravel or sand to a patio project. Use tile pieces in the place of gravel for drainage sumps. Mix in broken ceramic or stone tile pieces with your walkway gravel. Drop VCT tile pieces into post holes before adding cement, or use them to hold potted plants higher in a window planter.